Gratitude is about focusing on what’s good in our lives and being thankful for the things we have. Gratitude is pausing to notice and appreciate the things we often take for granted. Gratitude is about taking a moment to reflect on how fortunate we are when something good happens — whether big or small. With Thanksgiving around the corner, it’s a good time to sit down with our families to reflect and be thankful for our many blessings. It’s beneficial not just for raising polite, pleasant children, but perhaps more importantly for your kids’ physical and emotional well-being, as well. In fact, studies have proven grateful children are happier, more optimistic and have better social support. In addition, grateful kids are more connected to theirs schools and community. But, being grateful is a learned behavior. It doesn’t come naturally to children. Dr. Bilge-Johnson offers 7 ways you can help your kids build an attitude of gratitude and make giving thanks — at Thanksgiving and beyond — their new normal. First things first, teach your children to say thank you until it becomes a part of their vocabulary. Start by teaching them to be thankful to the people that serve them, including parents, grandparents, teachers, friends and the list goes on. Make sure you’re saying please and thank you, as well. Like anything, when you’re teaching your child a concept, it’s best to model it. Encourage your kids to take part in the family’s daily functions. When kids help set the table or clean their rooms, they realize it’s not easy and can better appreciate the work that’s being done for them. 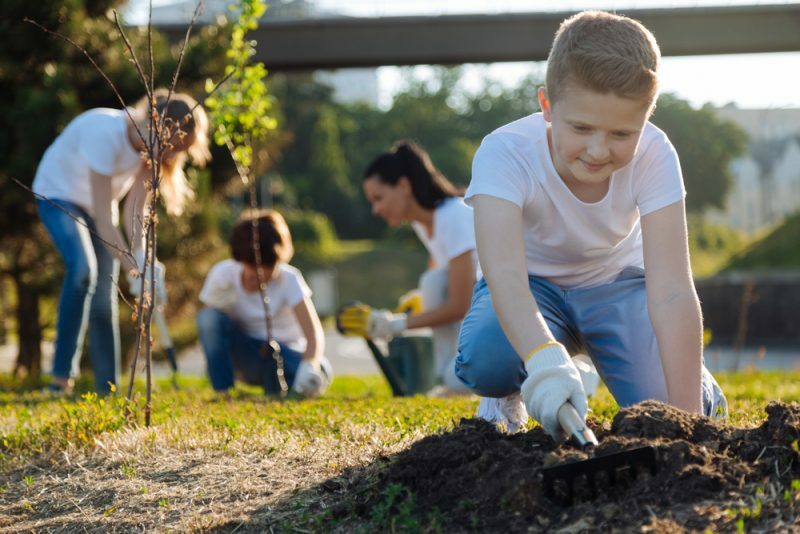 Get kids involved in charity events or community service. Not only does it give kids a role in helping others, but it also allows them to see with their own eyes that not everybody has what they have. We can tell them about kids less fortunate, but it doesn’t always leave a deep mark. It’s important to have some no’s in between all the yeses because it’s impossible to feel grateful when your every wish is granted. Kids need to understand that they won’t get everything, so when they do they will be grateful. It’s good practice to get into a routine of discussing the “roses” of the day and the “thorns” of the day. Whether it’s over the dinner table or at bedtime, it teaches kids to be thankful for the good things that happened that day. Plus, it gives you the chance to discuss ways to help them overcome the challenges of the day. Teach kids to see the bright side of things. Positive emotions can have a big impact on kids’ lives, leading to happier, less stressed and more connected children. In addition, positive emotions are more likely to lead to positive actions. When we feel grateful for someone’s kindness towards us, we may be more likely to do a kindness in return. In addition to your child’s Christmas List, make a gratitude list. Ask your children to write down what they’re thankful for in their life.